"Wow, I'm overwhelmed with the amount of essential r/c flight info you provide in this wonderful book. Don't know how or why anyone would pass up this incredibly comprehensive and complete manual." - Sam G., California. If you're looking to get started in what has to be one of the most exhilarating, addictive and fulfilling hobbies around, this Beginner's Guide To Flying RC Airplanes e-book will save you heaps of time, money and - importantly - frustration! With 135 pages of easy reading and concise information, this guide will give you a rock-solid start to your new hobby. No endless surfing around the 'net - just everything you need to know in one place. For you, a newcomer to this fantastic and hugely popular pastime, The Beginner's Guide To Flying RC Airplanes won't overwhelm you with all the unnecessary stuff that you don't need to know right now; it gets right to the point and answers all the 'getting started' questions that you're ever likely to have. Priced at just $17.00, it's a very small price to pay for learning how not to crash your new plane on its first flight! This e-book can be purchased securely through PayPal and downloaded in just a few clicks, by using the 'Buy Now' buttons on this page. Your e-mail address is 100% safe. Purchasing problems? Please let me know. Understanding RC systems & how they control your plane. What you need to know when choosing your first plane. Preparing your plane for flight. Finding somewhere suitable to fly. The essential pre-flight checks you need to know. Complete flight school to get you airborne safely (take-offs, flying & landing). How to fly some basic aerobatics. How to deal with a crash. What's in The Beginner's Guide To Flying RC Airplanes? "Not many hobbies have the potential to teach you such a diverse range of topics, or at the same time be as simple and straightforward as you want it to be. In other words, you can throw yourself into the model building side of the hobby as much as the flying side of it, and learn about model airplane design and construction techniques, aerodynamics, mechanical issues, model engines, electronics.... the list goes on. Or you can just buy a simple electric Ready To Fly airplane, charge the battery and go!" Mode 1 : the left stick operates elevator and rudder movement of the airplane, and the right stick operates engine power (throttle) and ailerons. With this set-up the two primary flight controls (elevators and ailerons) are on separate sticks and so you're less likely to inadvertently move one while intentionally moving the other. Mode 2 : the left stick operates throttle and rudder while the right stick operates elevator and ailerons. This set-up corresponds to a real airplane's control stick, or yoke, because the two primary flight controls are on the same stick. Personally I fail to see the relevance of this argument though, because flying a radio control plane and a real one are two completely different things anyway, and as someone who flies RC planes and has held a Private Pilot's Licence and flown full size planes, I know just how very different they are...."
"Elevators are the most important of all control surfaces, and as a result of the nose-up/nose-down attitude of the plane they directly effect a plane's airspeed. Up elevator will reduce the speed if engine power is not applied at the same time, while down elevator will initiate a dive and hence the airspeed will increase, as gravity kicks in. So don't just see the elevators as the things that make the plane point up or down - they really are more than that! The illustration below shows the effect of elevators on the plane's pitch attitude. As for transmitter stick movement, pulling the stick towards you will raise the elevator and pitch the nose up, while pushing the stick away from you will drop the elevator and cause the plane to dive." "The correct choice of RC airplane as your first one is going to have a big impact on your enjoyment of and success with getting started in radio control flying. Quite simply, if you buy the wrong kind of plane your first flight will likely end in disaster, probably seconds after take off, and you'll possibly lose all interest. I can't stress enough the importance of taking a bit of time and care when choosing your first plane, and this is actually a downside (about the only one...) to the wide availability and choice of radio control airplanes on the market these days - you can become very easily overwhelmed by the variety of planes out there, and if you don't know what you're looking for then it's all too easy to get impatient and make a bad purchase." "The radio control range check is a crucial one that tells you whether or not the signal from Tx to Rx is good, and hence whether or not it's safe for you to fly your plane. When you perform a range check you're effectively sending a much weaker signal from the transmitter to the receiver over a given distance. The picture below illustrates a range check, with instructions after...."
"If your plane has ailerons, use these in conjunction with up elevator to turn. Apply aileron and elevator to turn, and then opposite aileron to finish the turn and level the wings. You probably won't need much up elevator at all throughout the turn, but this is going to depend on the plane that you have. Return elevator to neutral as you exit the turn, or as necessary to maintain a constant height. If you are using ailerons on a four channel plane, don't worry about rudder for now. Use of rudder will come with time." As the samples above briefly show, each page takes you step-by-step all the way. So if you're thinking about getting into the addictive hobby of RC flying, buy your copy today and have all those questions answered! To buy The Beginner's Guide To Flying RC Airplanes today, just use the 'Buy Now' buttons on this page, and download your e-book in minutes. I've been helping people get in to radio control flying, via this website and my forum, for over fifteen years now. I'm passionate about it, and I love it. The e-book is a natural extension of my website, and over 3000 copies have sold to date - and I've had one person say that it didn't help them. I can live with that! Beautifully crafted! Thanks for a great read. Best regards, David H.
"Pete... so glad I found your website and ebook... 95% of my questions have been answered by your excellent resource, in a well written, concise and down to earth way... And the price is too good - you could charge 3x what you do and it would still be great value. ...Looking forward to your new book about radios!" "I was reading it today and you have done an excellent job. Most books are written by "experts" and you can tell by the way they write that they do not remember what it is like to be new to something. I have often thought that a book starting at "ground level" would be a great idea, and that's what you have done. Magnificent information!" "Thanks a million! Your e-book is very informative and written with great clarity. On my recommendation, my brother (also a RC plane novice) purchased your book and is reading it with zeal. Thanks for your priceless contribution to this exciting hobby. Best wishes!" "Thank you for the ebook. This book was as good as the helicopter one if not better. I wish I started with your airplane ebook first and then the helicopter, because your airplane ebook explains all the parts of a plane which you can use that knowledge for understanding a helicopter better! Anyway, perfect job thank you. I wish you and John would write more books to document your knowledge for novices like me. "I just wanted to report that purchasing your eBook has been a very positive experience. I am that quintessential "beginner" looking for RTF electric, and I've scoured the internet for objective ideas and guidance. There are so many different opinions that it makes one's head spin. I can't imagine anyone in my position NOT finding exceptional value in going through your well-written eBook before taking even the first step... Although I'm only 2/3 of the way through the ebook (a couple of very intensive hours paying very careful attention), I did want to comment that I think this is an excellent product." "Just wanted to say I bought your guide and think it's going to help a lot. After a couple of minor initial launch crashes (Stratus glider) after reading this I can now see where I'm going wrong. I've also invested in a sim for practise. Many thanks." "I bought your excellent eBook on flying planes, and indeed it has helped me enormously. If only I had bought it earlier then I would have bought the correct trainer and not blown three hundred dollars on the Radian Pro. Between your ebook and using Phoenix flight simulator I have been able to teach myself to fly. Thank-you Pete! I wonder how many people like me, have had success learning to fly from your eBook and the use of flight simulators! I for one realise you need more than a flight simulator to learn how to fly. You need the wisdom from people that know not only how to fly but how to relate their knowledge to others." "Your beginner's book for flying is very well done... very clear and just the right amount of detail. I'm just getting back into the hobby (after 40 years!) and this book was an ideal way to remember how this all works, and how the hobby has changed since I left it!..." "The Beginners Guide to Flying RC Airplanes is one of the most comprehensive and thorough manuals about flying RC aircraft that I have seen. It covers every topic in detail, the information provided is extremely helpful to the beginning RC pilot. Upstate RC Flight Training will be using this as our main instruction manual; teaching with this manual will make things more understandable for our students." 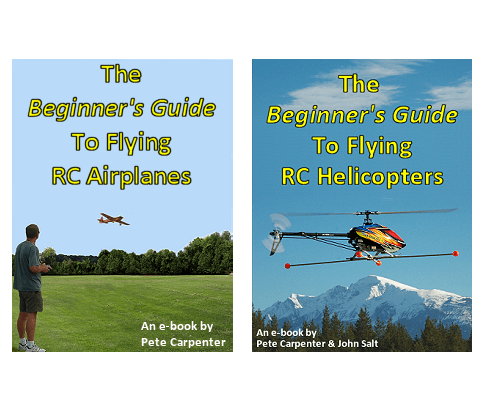 "I am a Beginner RC flyer and look forward to reading your wonderful books! I have been looking for such books for some time, and yours is the best. Thank you for sharing your interest and experiences in RC flying with people all over the world." "Excellent book! Very good advice...Guess who went out and bought a P51 Mustang and smashed it to bits in about 3 seconds, and only then decided to read up about it?.. Very good advice on starting out in the hobby - now flying my Island Hopper 4 Ch trainer, and repairing the Mustang in my spare time. Excellent value for money. Thanks." "I was reading your book, and was hooked. Usually I don't do well reading at night when I am so tired, but your wonderful and easy to follow writing stile had me so absorbed, I forgot how tired I was. Very well done indeed! I was remembering my "learning days" and would have loved a resource like this when I was starting out - it would have saved so much time and money...."
- John S., Canada (rchelicopterfun.com). "I've only just had quick read through and it looks to be just what I am looking for, very concise and very easy to understand which is very important to a beginner..."
"Your Beginner's Guide to Flying RC Airplanes helped me to buy two planes for Dad for Father's Day - your guidance was right on." "The Beginner's Guide To Flying RC Airplanes" is an e-book, it's not a hard copy book. In other words it's a PDF file that you download and save to your computer - please be clear on this before you buy it. You'll need a PDF reader installed on your computer to read the ebook, the most common is Adobe Reader which you can get from here if you don't already have it installed. When you buy the e-book, you will receive an e-mail from pete. carpenter 12 @ gmail . com (no spaces) which contains a link to the download page. Please add that e-mail address to any whitelisting feature you have enabled, to prevent it being filtered as spam. When you download the e-book, save the file to your hard drive. If you simply open the file and start reading without saving it, you'll lose it when you close the file. The RC Beginner's Guides e-book combo - save! Why fly one aircraft type when you can fly two?! Many of us like the idea of flying rc airplanes and helicopters. If you want to know about learning to fly both types of radio controlled aircraft, you can purchase The Beginner's Guide To Flying RC Airplanes and The Beginner's Guide To Flying RC Helicopters e-books together and save some valuable dollars. The cost for this deal is just $25.00 - truly fantastic value for so much info. You can get the ebook combo deal here. Both guides follow the same easy-reading format and style, and contain equal amounts of essential information to get you started safely in this perfect pastime. The Beginner's Guide To Flying RC Airplanes e-book is a very genuine and original resource for anyone looking at getting in to flying radio control planes. If, after you've read it, you're dissatisfied with the information contained within it please e-mail me and I will sort out a refund, this offer is valid for 60 days from the date of purchase. Please don't ask for a refund if you thought you were buying a hard copy book but then downloaded the e-book. I cannot make it any clearer throughout this page that this product is an e-book and not a hard copy book! To buy The Beginner's Guide To Flying RC Airplanes right now, just use the 'Buy Now' button below and download your e-book in just a few minutes. Payment is safe and secure, through PayPal. "All I can say is WOW! I just finished reading Pete's ebook and I can't say how Great it is. THANK YOU PETE. After reading it I can't recommend it enough to anyone that hasn't read it. It is so full of information and instruction that I feel confident in saying if you follow it you can't have anything but success in the hobby. He speaks in new peoples language (simple English). Also I can personally vouch for everything it said.... Anyway I just wanted to say Pete you are the greatest and you can teach and old dumb dog to look somewhat intelligent. Thanks AGAIN I mean it." 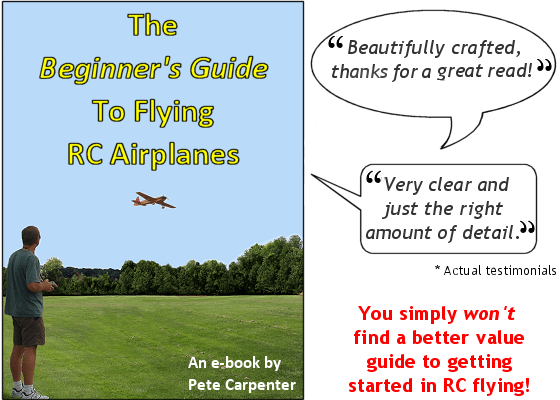 Ask me about The Beginner's Guide To Flying RC Airplanes, if you have questions about the e-book or purchasing it. RC Airplanes & Helicopters ebook combo deal. Please contact me if you have any questions or concerns about buying my e-books from this page. Save some money when you buy both of my e-books together. You'll get both download links for the airplane and helicopter guides for just $25.00 - simply crazy value! Purchase the e-book combo deal here.